dBpoweramp Reference portable created for Audio Professionals, who demand more: more technical, more features, more pro-codecs. Supplied as default with Broadcast Wave Format (BWF), Dalet, Wave64 codecs. Supporting IEEE floating point conversions (right through DSP effect chain), multi-cpu capable encoder. Apply VST or DirectX DSP effects whilst converting. 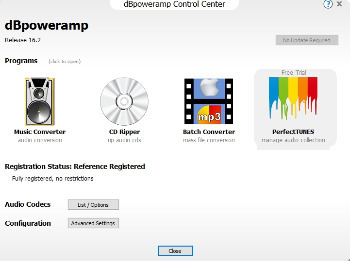 When choosing an Audio Converter, no other audio program converts more multi-format audio files than dBpoweramp, we have spent 8 years perfecting format-compatibility and conversion stability.